Powerful Solutions to Stop Infringement Before it Starts! 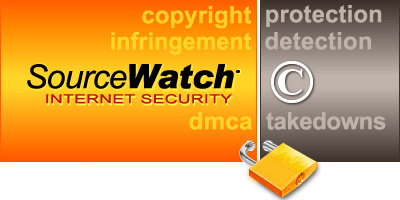 SourceWatch saves you time, money and aggravation by providing practical solutions that help protect your online content, and lets visitors know that you take copyright infringement issues seriously. With more than 20 years of proven website protection and enforcement experience, SourceWatch delivers a powerful set of protection plans that are cost-effective, easy to implement, and get results. We also provide in our Control Panel all of the tools we have used over the years to detect infringement, due diligence on the infringer (website intelligence), infringement documentation, infringement analysis, determine the infringement score, and the best action to take against any infringement. SourceWatch provides content protection tools that seamlessly link to your custom SourceWatch Warning Page, like this. The Warning Page is linked from your website to ensure that visitors know you value your content and take copyright infringement issues seriously. 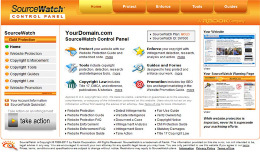 The SourceWatch Gold and Pro Plans also include your own custom SourceWatch Control Panel that is password protected and provides added protection and enforcement tools including Image protection tools, simple cut/paste code, triple cloud hosting, and a wide range of copyright enforcement, methods and tips all designed to help stop and enforce infringement issues. You’ve spent a lot of time and money developing your website, why not invest a few more minutes to determine the best way to protect it?